Carmen's wedding theme colour was silver and royal dark blue, and wanted to customize Dainty Daisy collection of cards to suit her needs. We changed the ribbon colour to dark blue, and kept the front cover font colour in light grey (silver). The dark blue ribbon looks stunning against the white pearlescent card. ﻿Michael who have been a long time customer of ours approached us with a very specific card design in mind. 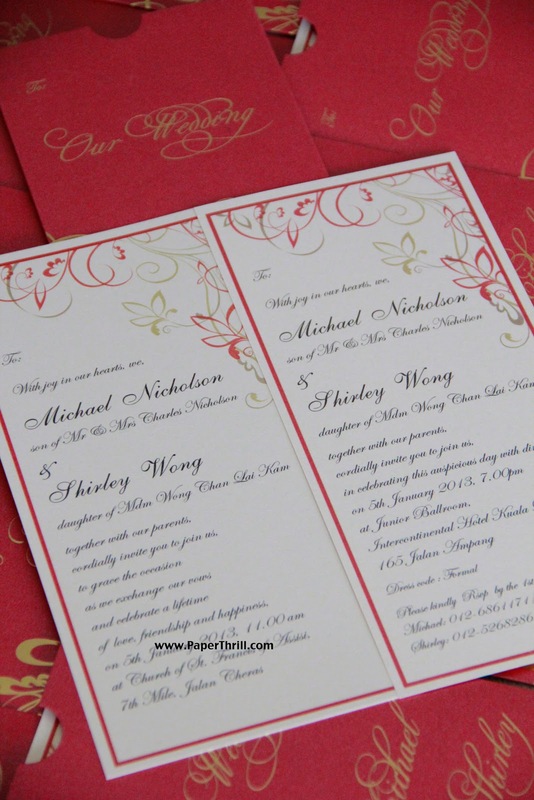 He needed a pocket envelope card to hold the main invitation of the church and dinner invite. 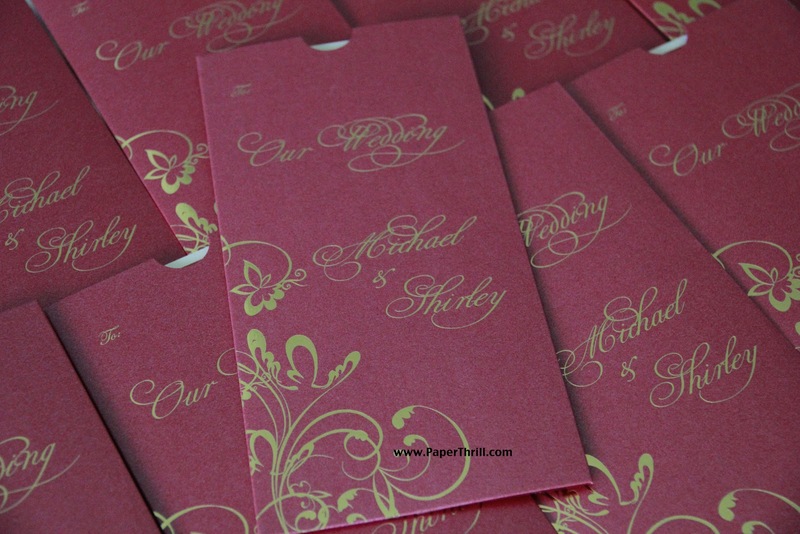 The pocket envelope was hotstamped in gold with the couple's name and a floral swirl motive which was also incorporated into the main invitation. 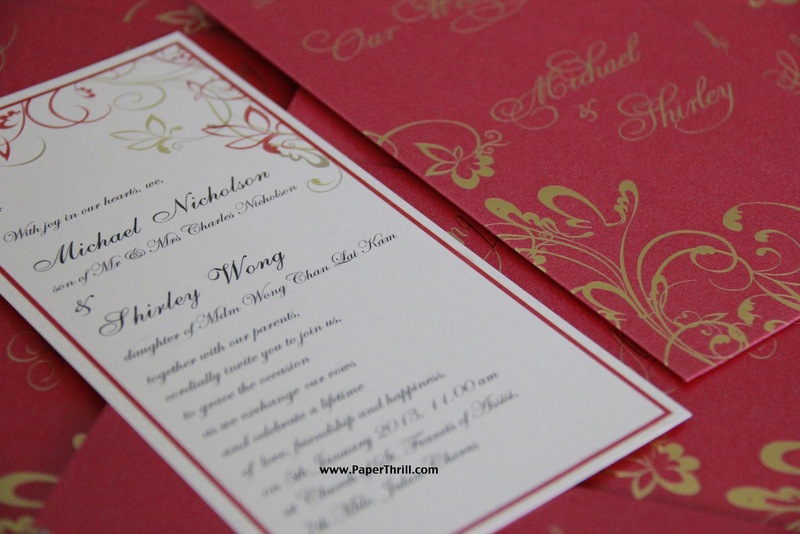 Yee Ling loved the oriental knot card, as it suits her wedding theme perfectly. However she needed to have both English and Chinese text printed, and our original oriental knot design could not cater for that. So to accommodate both texts, we tweaked the design a little. 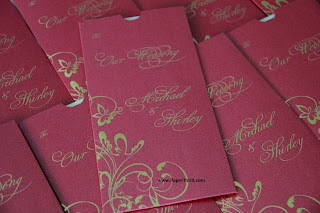 We changed it to a square tri fold card, with the knot placed off-center. On the inside, a folded inlay with both English and Chinese text is printed. We suggested to use an off white textured card with a bright chilli red oriental knot, to give it a more modern twist - and she loved it!